The Petronas Towers in Kuala Lumpur, with a height of 452 m, were the world’s tallest building until 2003. These gigantic twin towers are the headquarters of the Malaysian oil company “Petronas”. Petronas is the acronym for the National Oil Corporation of Malaysia, incorporated on August 17, 1974. Full government ownership, the corporation handles all petroleum and petroleum products in Malaysia. Today, with over 100 subsidiaries and associated companies, Petronas Group operates in 25 countries around the world. 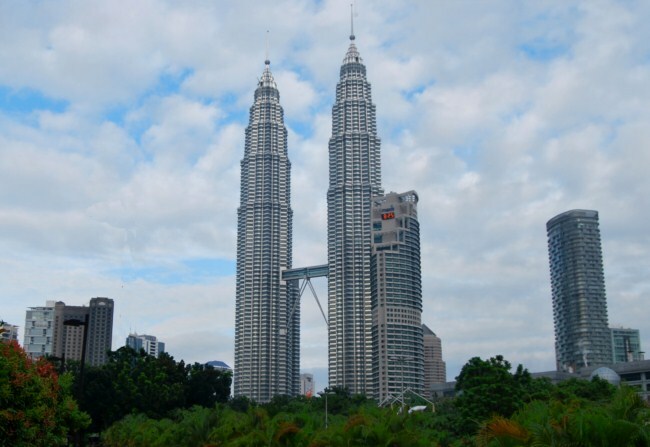 The construction of the Petronas Towers was due to the inordinate ambition of the Prime Minister of Malaysia, Mahathir Mohammad. According to the leader, the new symbol of the country should be a traditional character building, unmistakably Malay stylistic elements of Islamic origin. The architect Cesar Pelli (pictured) conceived as a base eight-pointed star-Islamic symbol representing the order and harmony, to which was added a series of semicircular convex for expanding the usable area. For the structural engineer Charlie Thornton, this base unsuspected possibilities offered sufficient to convert the Petronas towers in the tallest building in the world. However, the omens for the construction of skyscrapers were bad from the start. Shortly after the laying of the foundation stone in 1992, the work was halted because the underlying rock in the place where it was expected to boost the building was too fragile to sustain the towers. Therefore, Thornton chose the complex move about 60 meters and lift the skyscraper on soft ground. To fill the foundations of the towers had to take a special concrete compaction large capacity for 52 hours straight. Petronas Twin Towers were finally worked in steel and glass and by June 1996 and were nearly complete. The 60% of the materials used, was locally produced. After that ended in January 1997, the first team Petronas staff moved into their new offices in the tower 1. View from outside the towers show a diamond-shaped facade carved. This coupled with external architectural details, fan them their unique shape. 893.500 meters square has stainless steel protrusions. The use of this type of steel, not only reflects high technology in Malaysia, but also offers a tropical look under the glare. Both buildings are topped by pinnacles steel measuring 73.5 meters high. Making each take nineteen weeks, one in Korea and one in Japan. The Pinnacles play a very important part. The decoration shows a mixture of traditional and moderated. Mont Saint Michel in France. « The Nile in Africa.